Perhaps I should have posted this somewhat earlier in the day . . . .but, err . . . . I had to go out to take some photographs!!! Anyway, I hope our dear Captain and all the Crew here aboard the good ship CaptainsVoyage are having a very happy St. Cecilia’s Day! Umm . . . maybe we should rename it Lady C's Day and make it an annual ship's celebration! . . . CHEERS ALL !!!! Wishing you all a Happy St Cecilia's Day! 1869  In Dumbarton, Scotland, the clipper Cutty Sark is launched  one of the last clippers ever built, and the only one still surviving today. Perhaps our French members might be interested to know that on this day in 845, the first King of all Brittany, Nominoe defeats the Frankish king Charles the Bald at the Battle of Ballon near Redon. I only now, today, realised that it was on 22nd November that writer George Eliot was born. Oh I wonder if my mother had known that? For there is a family connection in that around the time my mother married, my grandfather farmed on the estate in Warwickshire where George Elliot was born and spent childhood years. I certainly knew that it was the birthday of the composer Benjamin Britten, for I have enjoyed his music since my youth. One of his works is linked for me with the most notable event to have taken place on the 22nd of November, this year the 50th anniversary  the assassination of President John F Kennedy. It is often said that everyone in the appropriate age group can remember what they were doing that day. Well, I was at home with my parents and had just been telling them that I would like to listen to Britten's War Requiem on the radio that evening, when the news broke. In the event, with programmes cancelled as inappropriate throughout the day and replaced by an early example of the 24/7 style news coverage that we now take for granted at such times, only the appropriately sombre War Requiem was broadcast as scheduled. Also a very happy day back to you. Such a sky is a nice sign in a grey November week, where we hardly see the horizon here and have wet +3°C. No you don’t! …that would be too much about me and too little about Scotland and England! Yes, Happy Day. And down here the sun shines to emphasise the fact. I must add another "special" happening today. 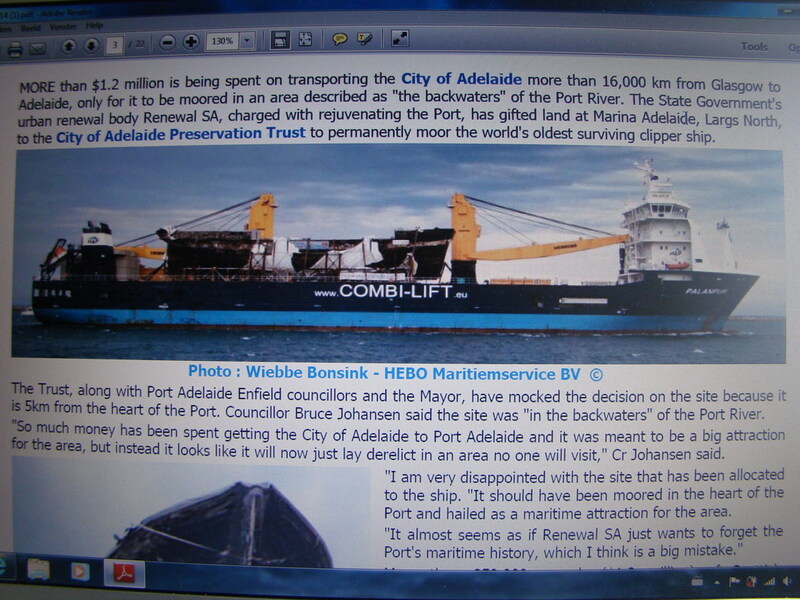 Hopefully, if it goes to plan, the HLC Palanpur will be at Heyshaven, Rotterdam, to load the City of Adelaide for transport via Norfolk, Virginia; Cape Town, and thence to Port Hedland, WA, Dampier, and round to Adelaide, SA. Actually, Cecilia she predates the Cutty Sark as the oldest surviving clipper by 5 years. So pleased that my rather random quote prompted your response Ivy , and now that you’ve caught my interest I see on this BBC page that I missed a Scottish connection! About Nominoe:as we have big social demonstrations since few weeks in Brittany Nominoe is quite a star! ...and I'd never even heard of him before, Yves! So pleased that my rather random quote prompted your response Ivy , and now that youve caught my interest I see on this BBC page that I missed a Scottish connection! So you obviously did not see my post a few weeks ago, Cecilia? But what a serendipitous thing that St Cecilia drew this to my attention in a roundabout sort of way! 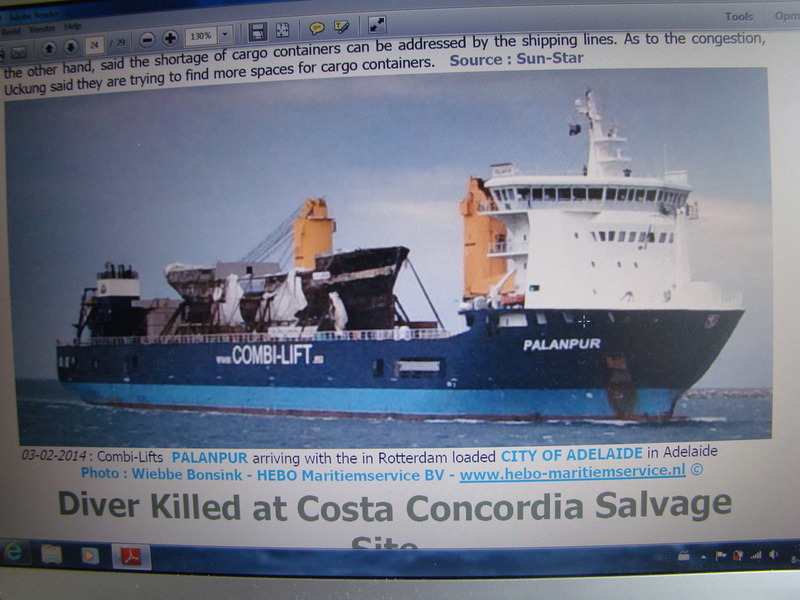 There is a picture of her being lifted and load on board the Palanpur in Rotterdam on the Maasmond Maritime - Shipping News Clippings today. Sounds like a long trip with a lot of other cargo being loaded as well. 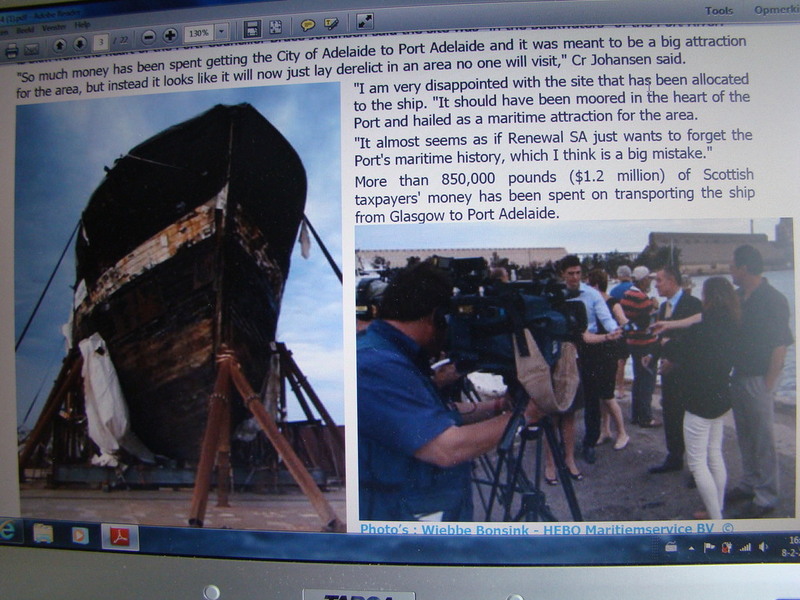 It was my Aussie friend who told me about the City of Adelaide after we had visited the Cutty Sark together. I checked it out and was very interested to read her history. She came down to London, where she was moored next to her "sister", Cutty Sark, for a brief time before being transported on the barge Louise van der Vees, towed by the tug Dutch Pioneer down the Thames to Sheerness, in Kent. Excitedly I watched her down the river, then she seemed to stay in Sheerness most of the day and I didn't think they would cross the channel at night with a cargo like that. But next morning they were all in Zeebrugge. There my trail stopped. I found the tug again later, but heading south and obviously on another job. Meanwhile no sign of the barge. The C. of A. was shrinkwrapped in Dordrecht but somehow I missed the to-ings and fro-ings there until by sheer chance checked the other day and found the Palanpur yesterday, moored east of the Benelux tunnel in the Nieuwe Maas. But I still didn't know whether she had loaded the cutter. Unfortunately I can't find that picture of The C. of A. being loaded, perhaps because I am not subscribed. I would so have loved to send it to John, he'd be thrilled. There is nothing in the Online Shipping News as far as I can see. Yes, I could see that and went right through it twice, but no sign of the Palanpur. I can only get up to pages 20/21. Is there more? PS, wait a minute - got it! The print is miniscule, almost unreadable and I didn't recognise the shrinkwrapped object for what it is. PPS. Ok, have found that it can be enlarged. 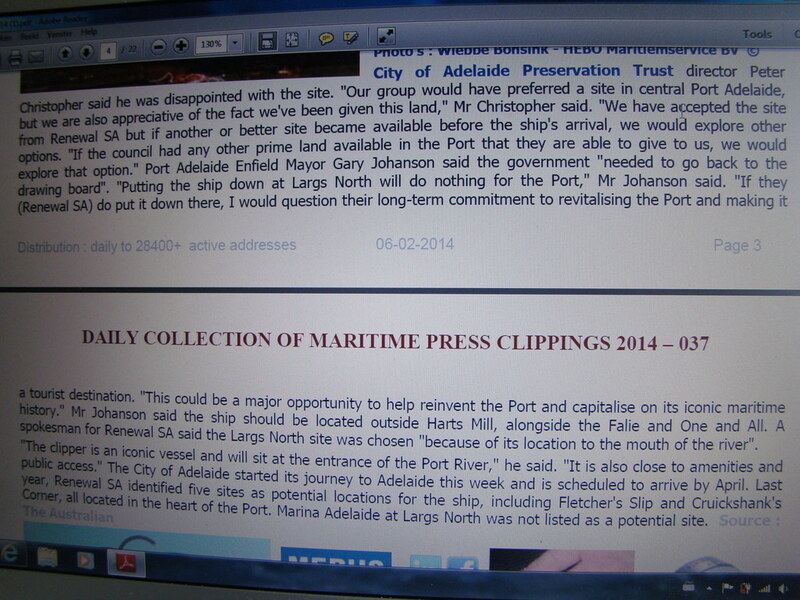 Snipping tool has done its work and I can despatch it to John. Thank you. I have passed it on to John, it's an excellent video. There is a picture of the departure from Rotterdam in the Newsclippings today. wel lets place the end of her journey too, from maasmond newsletter. 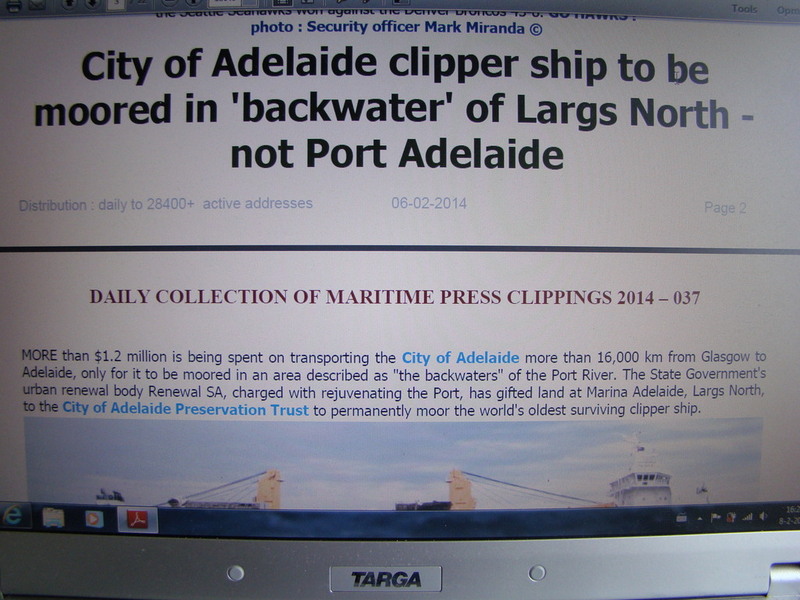 but maybe it's better if these replie's go to a better thread,we where so far OT with the ''çity of adelaide''. Yes Thijs, as I told you, I'm starting a special thread for it soon.